Like Brad Pitt’s eponymous character in The Curious Case of Benjamin Button, the Facebook pages created by some participants for their businesses, though in their infancy, are “already dying”. In a workshop organised by STJobs on 25 May 2012, 17 sales and marketing professionals from industries as diverse as retail, HR and IT received valuable tips from trainer Tom Abbott on how to create viral content and address negative feedback on social media platforms, integrate these platforms to their business model and achieve unprecedented growth through the enhanced visibility of their brand. Abbott, who is the Founder and Director of Soho Sales Coaching as well as a regular contributor of sales articles to local newspapers and magazines, compared Facebook to a “social mall” and encouraged businesses to “go where the traffic is”. He shared entertaining yet acute insights on managing and maintaining a successful online presence through Facebook, Twitter, LinkedIn, Youtube and Pinterest. This struck a chord with George Valenznela, Manager of Everbest Indonesia, whose biggest takeaway is learning how to “create and push content” on social media. 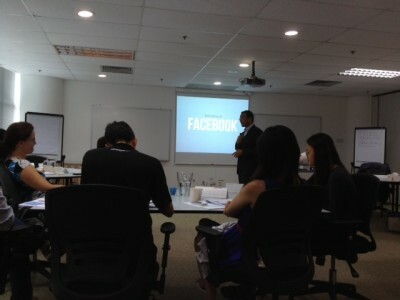 He came to Singapore on an early morning flight just for the workshop and flew back to Indonesia that same night. Simon Ng, Academic Tutor of economicsfocus.com.sg, also praised Abbott’s “enlightening” delivery and pledged to work on his recommendations and ideas in media marketing strategy. Has your business manipulated social media to its advantage? Join STJobs for more seminars and workshops here!